Check out this great information on the Blue Ridge Parkway from www.blueridgeparkway.org. 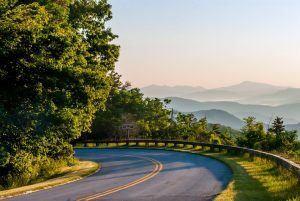 The Blue Ridge Parkway is a ribbon of road that weaves through the region’s vibrant living traditions. From Cherokee life and agricultural history to Southern Appalachian crafts and music, the Parkway’s 469 miles through Virginia and North Carolina offer many ways to explore rich traditions. Millions of visitors enjoy the Blue Ridge Parkway each year. Some think of it as just a motor road or a pleasant drive. But the Parkway is also a place of varied and significant natural resources.